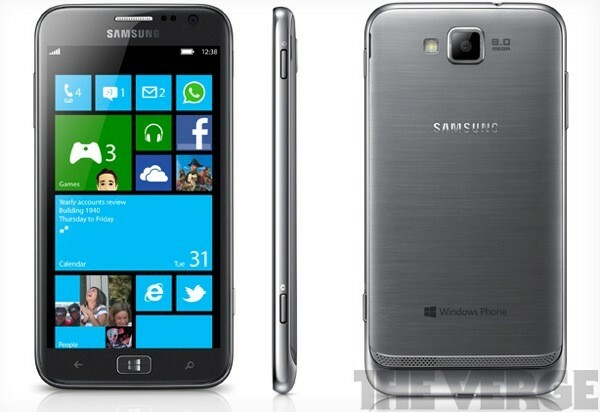 Straight from the pre-IFA press conference, Samsung announced the first official Windows Phone 8 smartphone – the Samsung ATIV S and The Verge has got a snapshot out of it. This latest addition to Sammy’s flagship phones has a Gorilla Glass 2, 4.8-inch screen with Super AMOLED HD resolution display. The smartphone runs in 1.5GHz dual-core Qualcomm Krait CPU and 1GB of RAM with memory expansion slots. Dimensions are 137.2 x 70.5 x 8.7 mm in a whole 135-gram hardware. Shooters are 8MP and 1.9MP for rear and front respectively. Plus battery is juicing with 2300 mAh. Other features include WiFi, Bluetooth and NFC connectivity. It has 16GB and 32GB variants. Price is still a blur and availability is at par with Microsoft’s official announcement for Windows Phone 8 release.